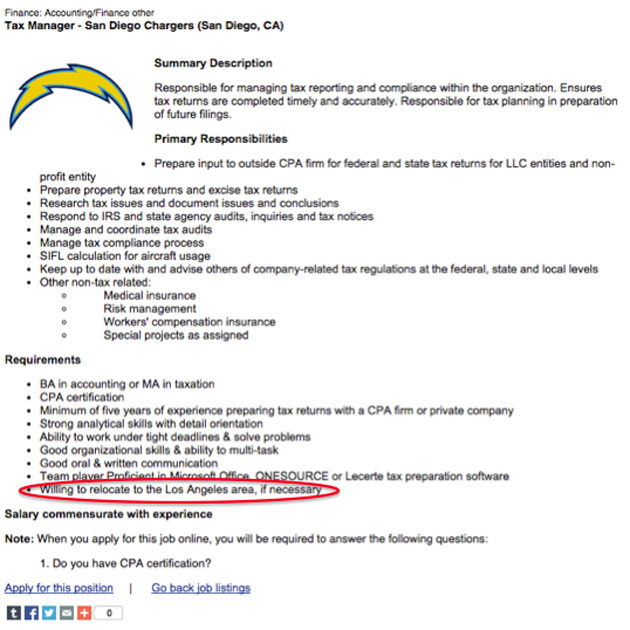 Want to work for the San Diego Chargers? You may have to move to Los Angeles. If you've been following the Chargers' stadium saga, you're already aware that the franchise may relocate to Los Angeles. But the team further acknowledged this reality in a recent job listing. The posting, for a tax manager position, lists several standard requirements for the job, like "good organizational skills & ability to multi-task." However, the listing also says that candidates have to be "willing to relocate to the Los Angeles area, if necessary." You can see the full listing below. Suggested addition: "Must be willing to share office space with the Raiders."